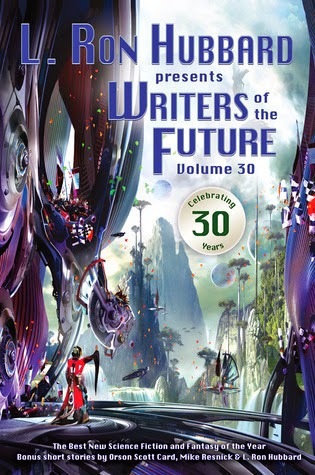 L. Ron Hubbard Presents Writers of the Future Volume 30 is available at Amazon, Abebooks, Barnes and Noble, and BooksAMillion. A collection of science-fantasy/speculative-fiction short stories featuring the winners of the annual Writers and Illustrators of the Future contest. I enjoyed the majority of stories in this collection. A couple stories couldn't hold my attention but I'm not going to name them because they just weren't my cup of tea. That doesn't mean they won't appeal to others. Each story was well thought out and it shows in the quality of the writing. I received a free copy of this book from Library Thing in exchange for a review. I'll admit, I'm not into Scientology so I was wary of L. Ron Hubbard's name in the title but none of that stuff made it into this book and, to be honest, the more I read this book, the more I didn't want the book to end. I'm a huge fan of short story collections, especially when they are well-done, so I'm glad I had the opportunity to check this book out. I look forward to hunting down other volumes.